....Make yourself at home in Joanne Sharpe's playful, colorful, whimsical doodle houses. Words, a message or theme always inspires the direction my art will take when i sit down with my journals or sketchbook. 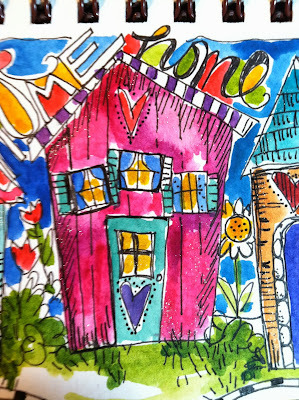 Of course, the SBC theme inspired me to just start doodling a fun collection of imaginary houses in my sketchbook. 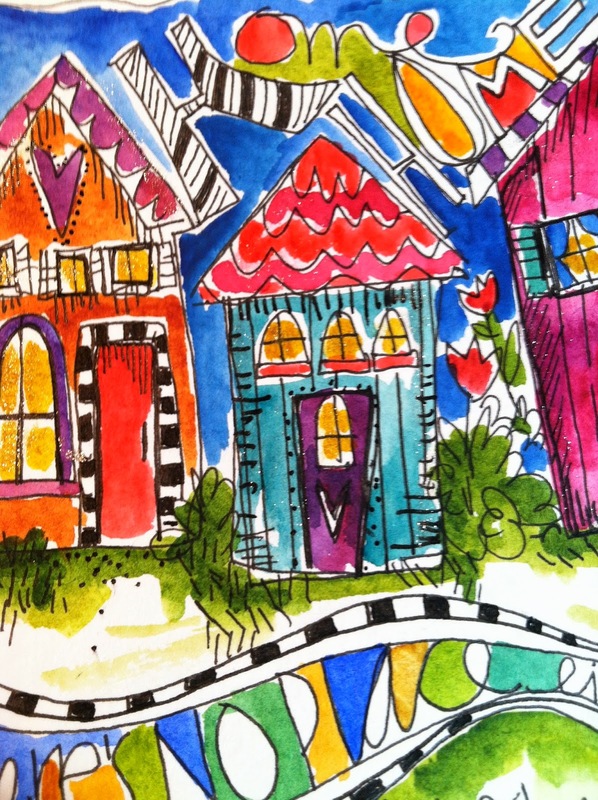 As i was drawing and watercoloring the houses, i thought, "wouldn't it be fun to see this type of house in a real life, in a real neighborhood on a real street"? Well, perhaps Disney World would be the most appropriate location home for this style of architecture. It's probably a good thing that i never went into architecture and home design! But i love these little row houses, flooded with color, and happy detail with windows streaming light. 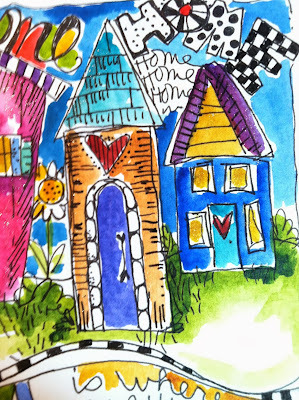 Of course i added lettering, using "home" words and phrases as a pattern in the composition. ...can you see the little sparkle on the houses? ...I added some glittery accents to the page with the Zig Wink of Stella brush pens in the CLEAR color (which is just pure inky glitter right out of the brush). The brush on this pen is the identical body of the Niji waterbrush. When the pens are empty you can use it as a waterbrush, or fill it with your own inks. Since i am a confessed "pen hoarder", it's one of favorite new tools. 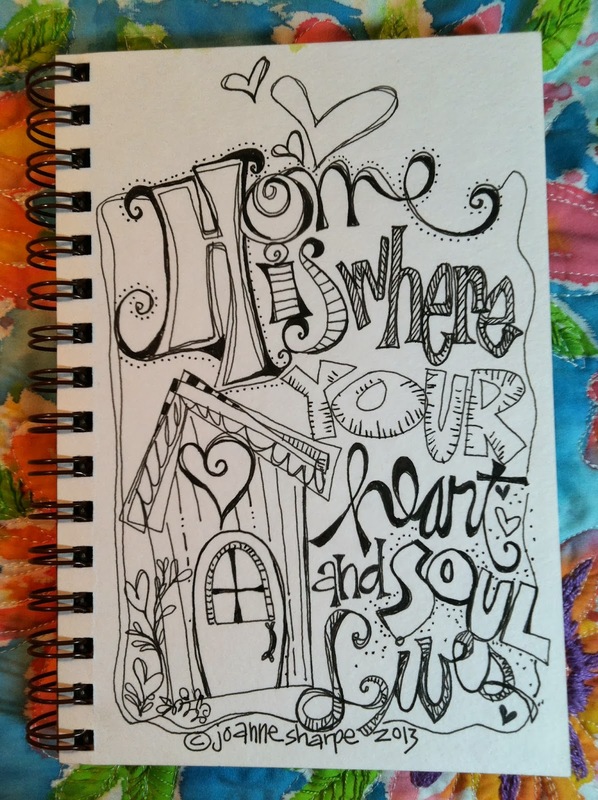 I also made this "Home" doodle on another page and before i color it, i made a pdf to share, a little gift for you! 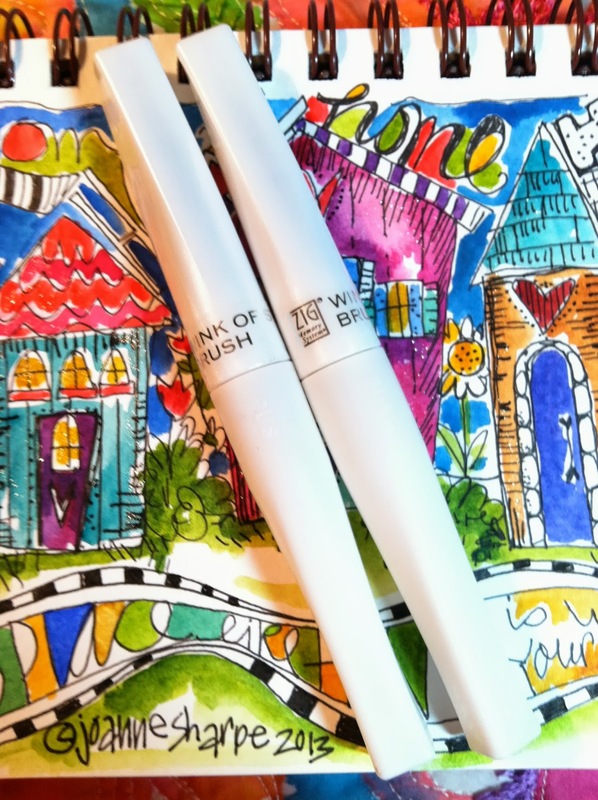 Grab your Tombow or Copic markers, watercolors, or colored pencils and add your own color palette. Use it as a color study or an inspiration for your own home. Paste it in your sketchbook or hang on your fridge, because that's what you do with your favorite art! "Home is where your heart and soul lives"
Here's the pdf to print and color. The image size is about 5"x8" and will fit into a medium sized sketchbook. Have fun in your cozy home! Terrific information for my fun. Thanks for the pen info and I've downloaded your pdf so I can do art this afternoon. Thanks so much. Really such whimsical houses...I love them. Thanks for the pdf and I MUST get one of those pens for my Christmas cards. Thanks for the pdf, Joanne - we must be on the same wavelength because I just did a scene last night using a row of colorful houses - boardwalk/water/sand and color style. The houses are from a Tim Holtz die, that I was questioning why I bought it, but I just turned the die cut it into a stencil (coated it with a couple coats of matte medium on both sides first). Thanks for all the inspiration you provide! classes, workshop, products and more! 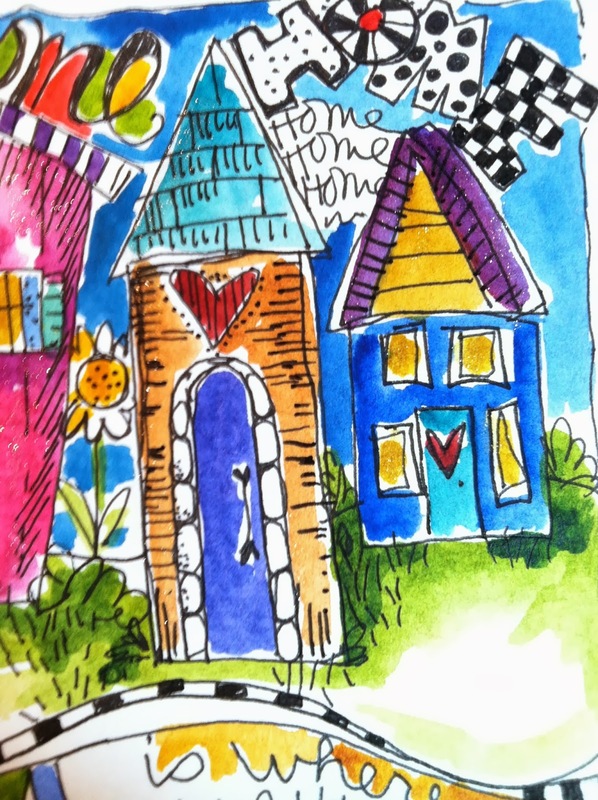 The Sketchbook Challenge Blog Hop Starts soon!